When looking at credit cards, it helps to check out offerings other than from the banks. Credit unions may not be for everyone, but since these financial institutions work in a way that’s so much different from traditional banks, they are able to offer more consumer-friendly options when it comes to credit cards. 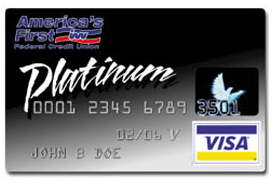 America First is currently promoting its Visa Platinum Card. This card is further specified into two types with rewards one would prefer. These are the low rate and the cash back platinum card. As the name suggests, the Platinum Low-Rate card offers highly competitive rates. On a national level, ongoing rates are at a lowest of 11.45%. But once you apply for this card, you don’t just get 11% or 10% APR. You can even go as low as 6.99% variable APR. This is one of the lowest being offered by lenders these days. However, this card is available only for personal use, and is not applicable for business accounts. Since this is a variable APR, your rate will depend on your credit worthiness and upon the money market. However, you can expect your highest APR to go no more than 17.49% annually – a figure that is already the lowest for most banks. Because this offering already has a low ongoing rate, there are no special introductory rates, nor is there a cash-back reward. If you’re the type to use credit cards often not only for convenience, but also for its perks, then the Visa Platinum Cash-Back or Visa Platinum Rewards Card is for you. The rewards card allows you to earn a single point for each purchase you make at visa-approved establishment. When you’ve accumulated enough points, reward options await you from any of the participating and affiliated online shops with America First. This card also features a no-charge annual fee. On the other hand, the cash-back card allow you to get 1% return for each purchase you make that qualifies under this offer. The money you earn gets automatically deposited into your savings account every quarter of the year. Like the former, it does not require any annual fee. As for the variable APRs, both cards have a variable APR of 8.25%-18.00%. All three cards require a minimum limit of $6,000. Application to any of these cards is simple as one can go online to do so. Credit cards issued by credit unions most often yield more desirable offers than banks do. And with all these options from America First, you may soon find yourself heading to the nearest branch to set up an account.